Grandma bun and grandpa sweater. I am an old soul with a short skirt. WHAT, pray tell, is better than wearing an enormous 100% wool cardigan that envelops you completely as you battle through a miserably endless winter? I can think of nothing else, especially now that I own one for the very first time. "Own" isn't even the right word, because it's not like I just plucked it from the gramps section of the thrift store and handed over $4 for it. This puppy was hand-knitted by yours truly, and it's astonishing to me that every fiber of its being has passed through my hands and grew before my eyes from a tiny little woolly sprout to this oversized blanket-with-sleeves that I never want to remove from my shoulders until Mr. Sun is back full-force on this side of the earth. There's something about knitting that feels much more involved and intimate than sewing (depending on the project, I guess), so I apologize for the sentimental maternal-like gushing that's going on here. Crafty high -- I can't think straight. PATTERN: The pattern! 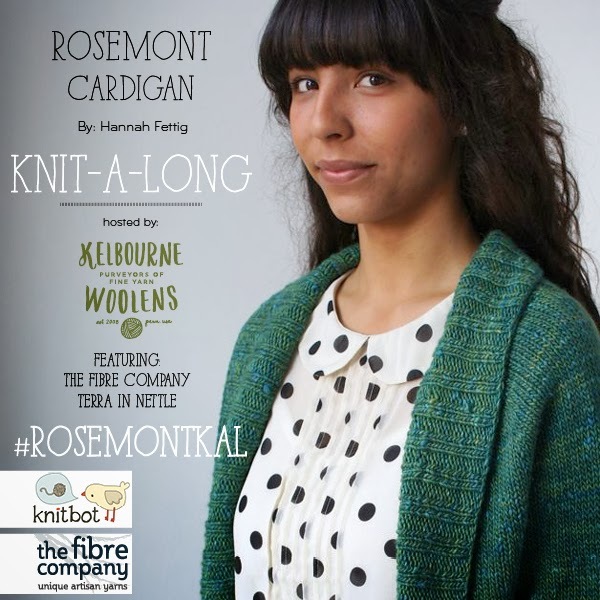 It is the Rosemont Cardigan by Hannah Fettig, newly released in February 2014. 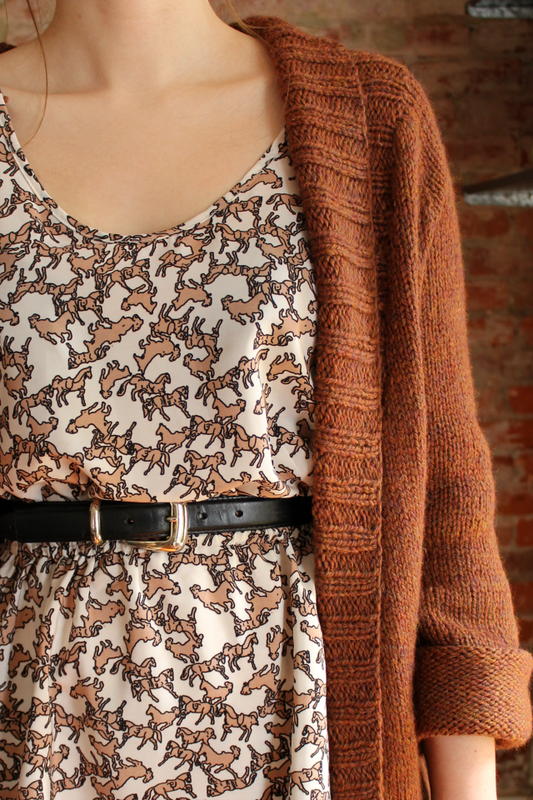 It's a shawl-collar open front cardigan that's knitted seamlessly from the top-down. Being new to knitting, I still don't know where to start to look for patterns as I don't have any go-to designers yet. 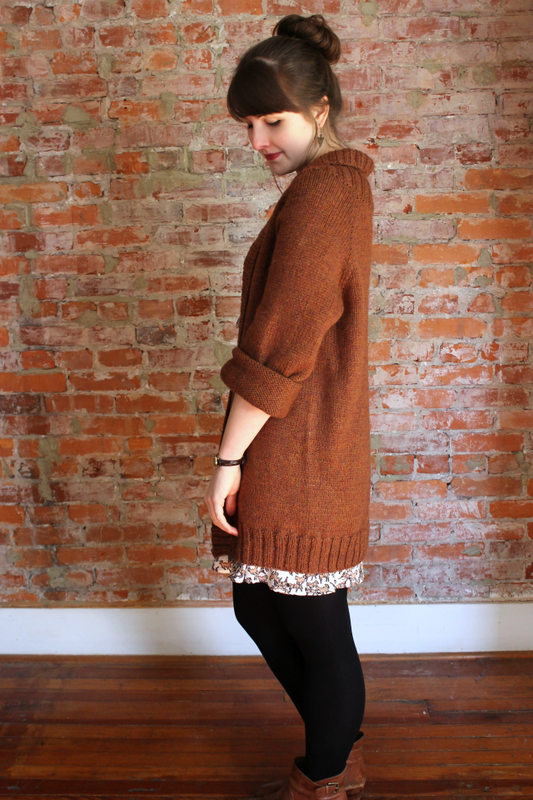 Ravelry is a wonderful resource but is absolutely overwhelming. Even if I filter by garment type, style, price, yarn weight, needle size, age/gender, and construction technique, there can still be hundreds of pages of patterns to sift through. And a lot of it is godawful. 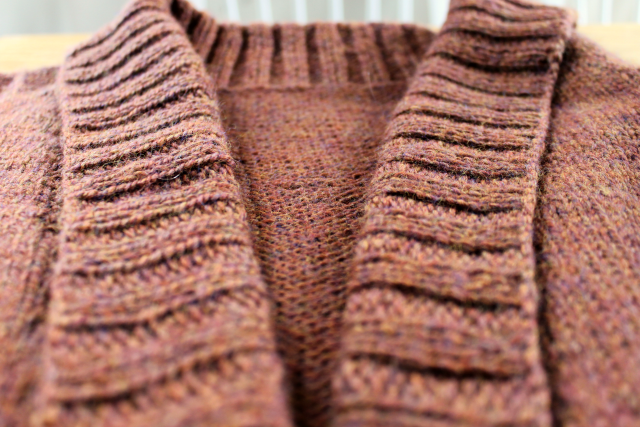 So, when I visited the blog of a local yarn company, Kelbourne Woolens, and saw they were hosting a knit-along for a new cardigan pattern, I jumped at the chance to have someone ELSE tell me what to knit. I liked that the Rosemont has no closures, is knitted with aran weight yarn, and is a basic, unisex style that's still pretty cute. I'm grateful for the Ravelry group and knit-along because the pattern's wording for the raglan and neck increases was incredibly confusing to me (and others, thank goodness). If you decide to make this pattern, definitely consult this post first, which explains the logic and order of it all. I would have given up without that help, really. 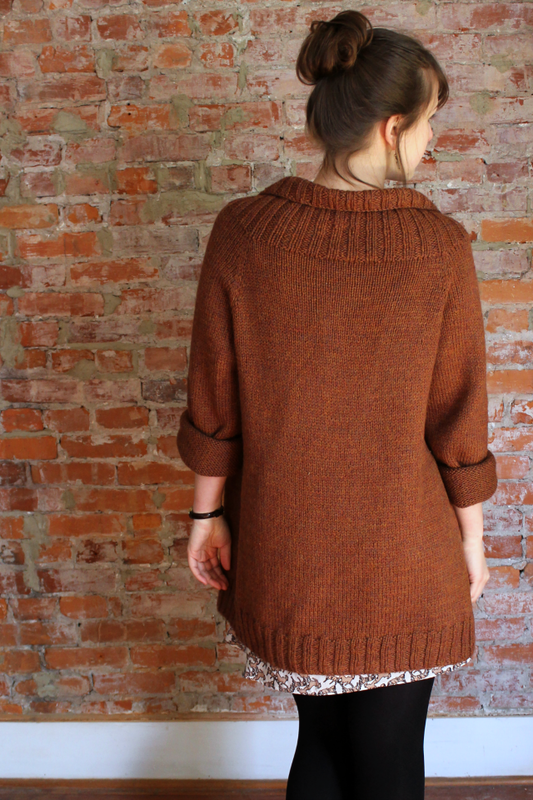 After that was all sorted out, I sped away from the group and finished the rest of the sweater within two weeks. The knit along is supposed to last two months! I am psychotic. SIZE: I decided to knit the size that corresponded with a finished bust measurement of 39.5", with an added five inches of length to the body. It's the third smallest size out of 11 (eleven!) sizes, so I thought that even though 39.5 inches sounded baggy, it would be fine. The model in the pattern photos is wearing the 36.75" and she's quite slim, so I thought it'd be safe to go up just one size from her. Okay, wow, this cardigan ended up much bigger than I thought it would be, but luckily I'm a fan of oversized sweaters so I'm happy with it. I guess my row gauge ended up being way off because I even stopped knitting the sleeves a full 10 rows sooner than instructed. Anyway, for a big fat yarn-eating cardigan for an unconfident knitter, I went the economical route and chose Knit Picks' Andes del Campo in the color Smoulder Heather. I don't know what the public consensus is on the quality of Knit Picks yarn (thoughts? ), but a 100% Highland wool yarn for $5.49/ball is hard to resist. I ended up using just over seven skeins so it's a relatively affordable sweater all things considered (not counting labor). 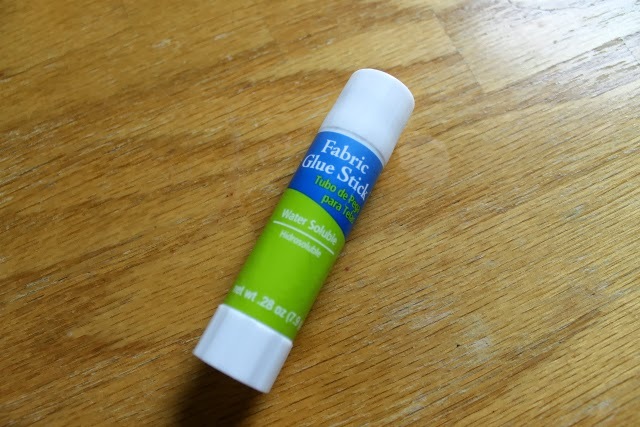 It's pretty soft and not that itchy on bare skin. I think this is ACTUALLY the first authentic wool sweater I've ever owned and worn. 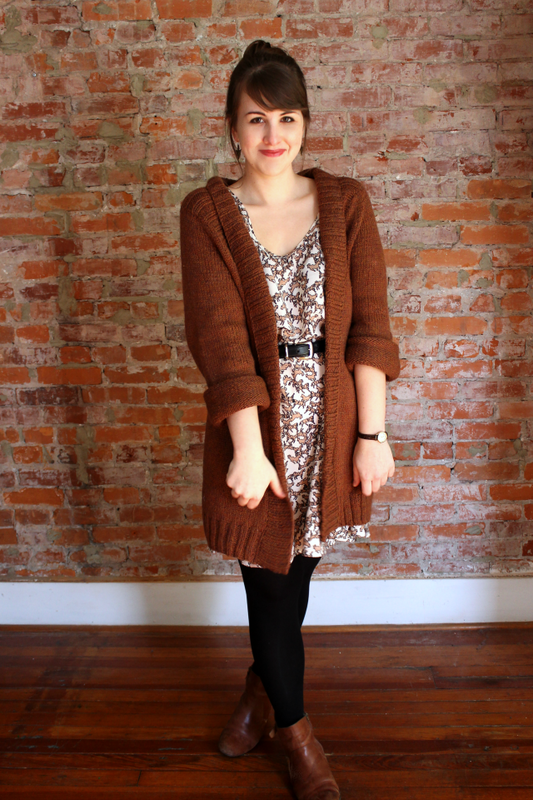 I have a ton of store-bought cardigans that are either cotton or some acrylic cocktail mix. CONSTRUCTION AND SHAPING: I taught myself how to do the knit stitch in continental style, which is SO much faster than English style, but I cannot for the life of me do purl stitches in continental style. I also can't knit continental on double-pointed needles, so my first sleeve felt like it took forever, especially since I always drop stitches accidentally on DPNs. I switched to the Magic Loop for the second sleeve, and since it was circular I could just knit continental nonstop without purling, so the whole sleeve took like 2/3 the amount of time. THE PONIES: Okay, I can't ignore the ponies. I sewed this basic dress in January from some silky poly I found at Jomar. Of course I liked the print, even though these are insane, chaotic horses tromping about all upside down and round about. Took me awhile to figure out which was way up -- or which way had the most upright horses. The dress itself is okay. 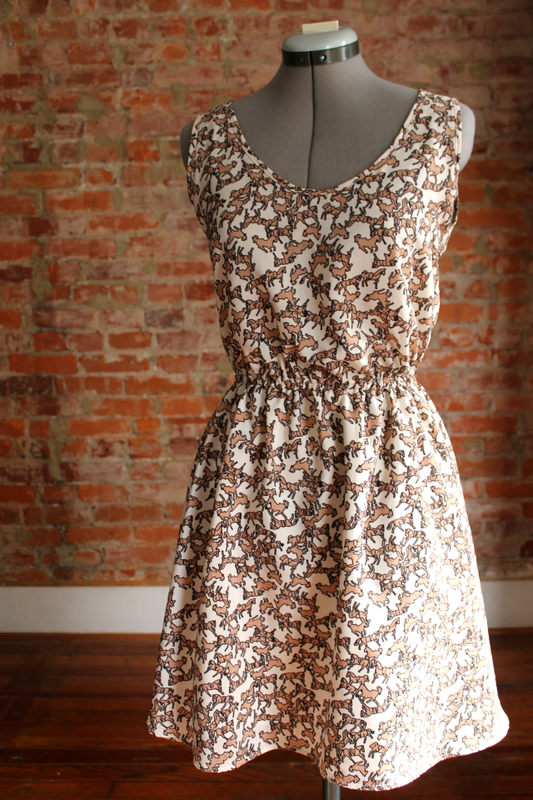 Sleeveless, elastic waist, lined skirt, self-bound neckline and armholes. It doesn't fit beautifully so it actually benefits from being overshadowed by a huge grandpa cardigan. 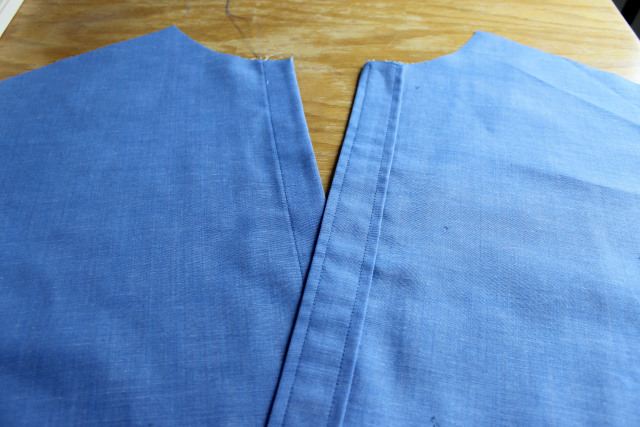 The pattern is (roughly) the bottom layer of the BurdaStyle Double Layer Tank dress, which I've used before. 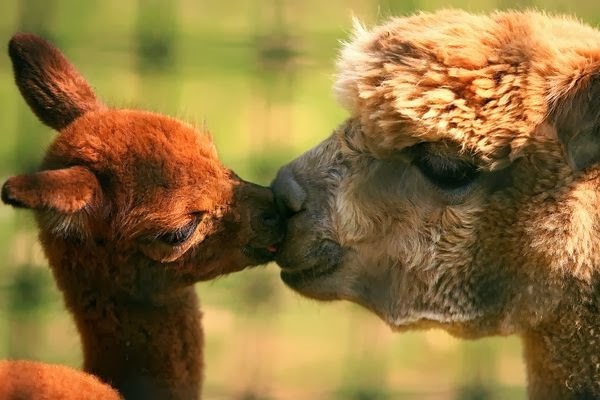 Alright my little alpaca babes, how are you staying warm? Is anyone else knitting the Rosemont or knitting/sewing something just as snuggleh? 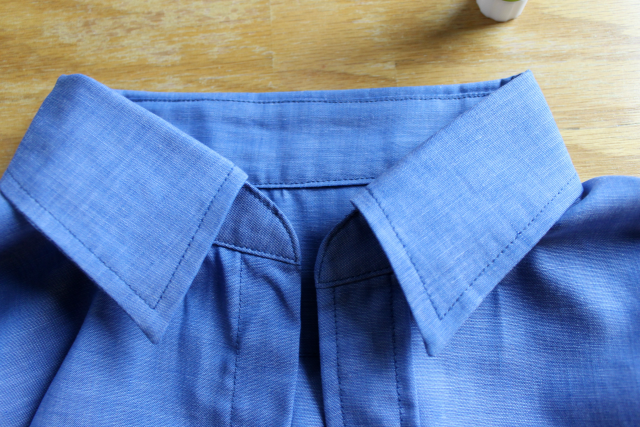 I'm thrilled that so many of you have found my tutorial on sewing a shirt collar to be helpful. 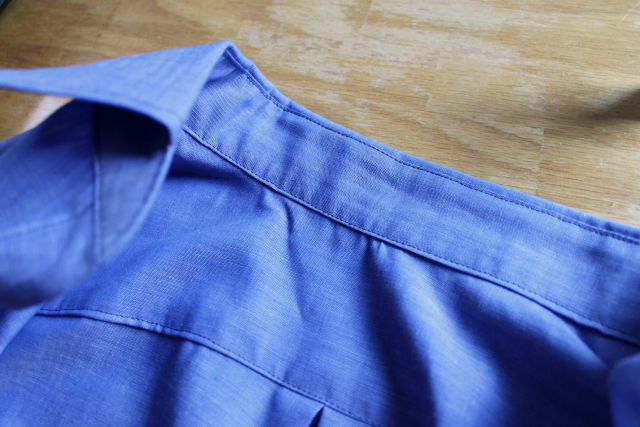 Thrilled enough to keep talking about sewing shirts. O'boy! 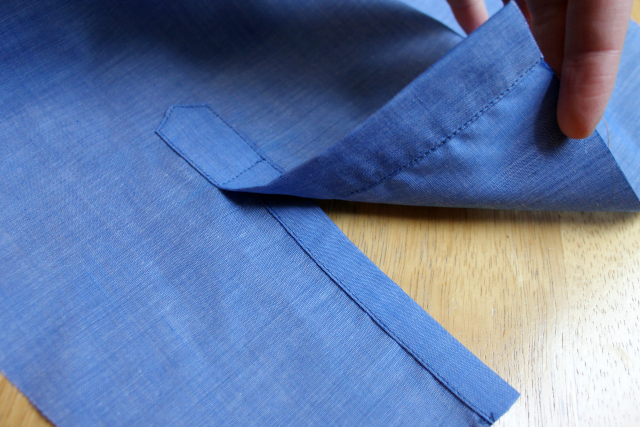 I'm continuing to feverishly sew button-downs for my main dude, so I'm slowly learning (er, improvising) all the little tricks to getting better results each time. It's satisfying to watch my skills improve and to figure out my go-to methods that lead to consistent outcomes. Translation: I'm addicted. 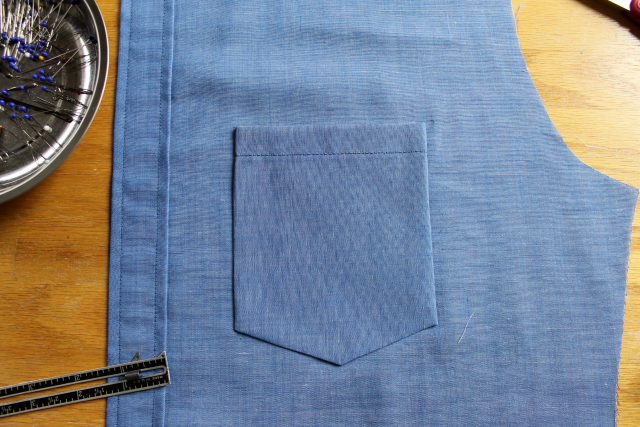 I also may have accidentally drafted a multi-size men's shirt pattern. Moving on! 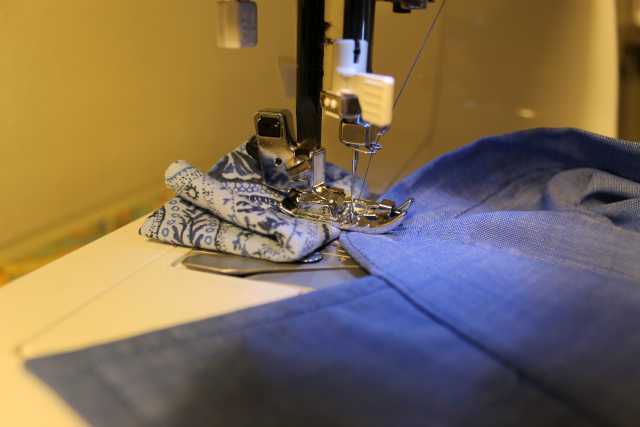 Since I'm just a home sewer with run-of-the-mill equipment you can find relatively easily, I thought I'd share with you the extra "tools" I use regularly when sewing shirts to help get the details right. Some of them are hardly tools -- just stuff. 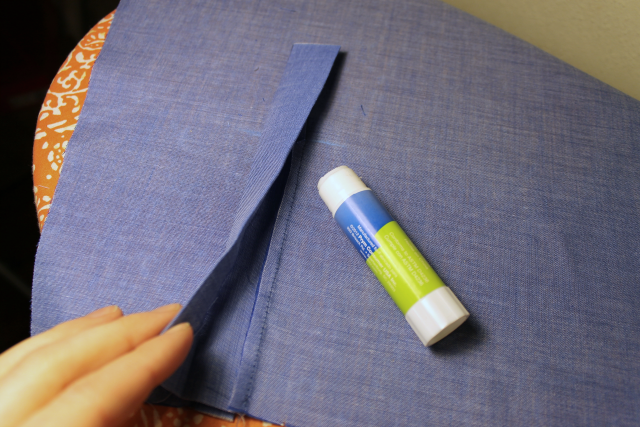 This list includes items that I use in addition to normal sewing equipment/notions such as a machine, ruler, seam ripper, etc. 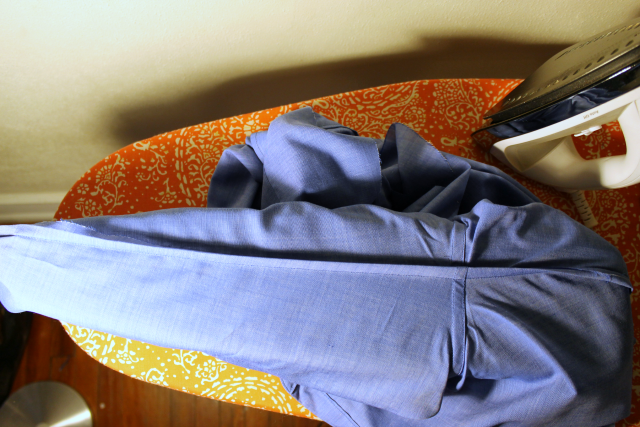 So none of these are absolutely essential for sewing a nice-looking shirt. They just make it all a bit easier. 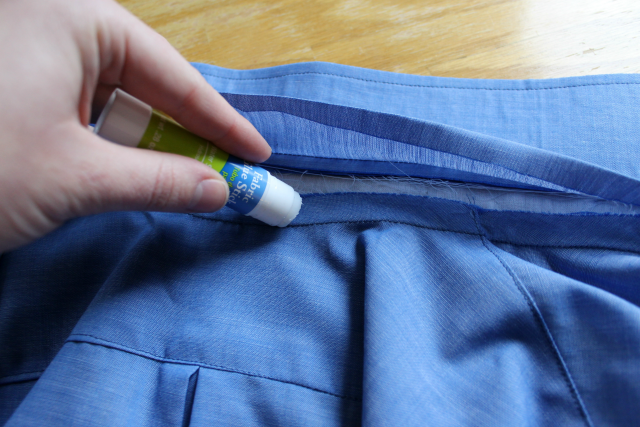 I've always used a glue stick to help attach centered zippers on skirts, ever since I saw this tutorial on Sew Mama Sew a million years ago. 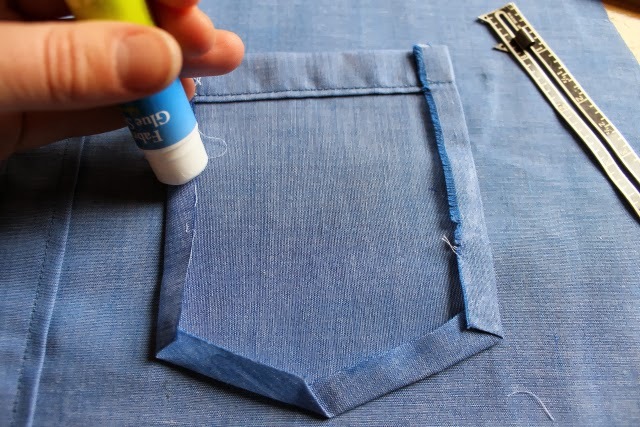 Now I use one throughout the shirtmaking process, too, particularly when I need to secure something on the inside while sewing from the right side. 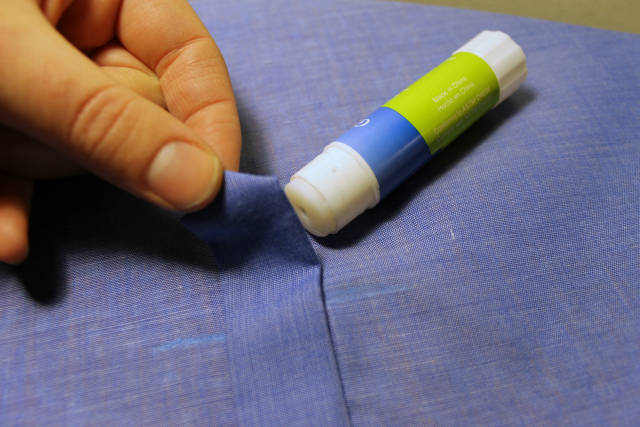 To me, glue makes it easier to control the fabric and get it perfectly positioned, and can be faster than basting and more secure than pinning, especially on slippery fabrics that will immediately shift as you remove the pins during sewing. 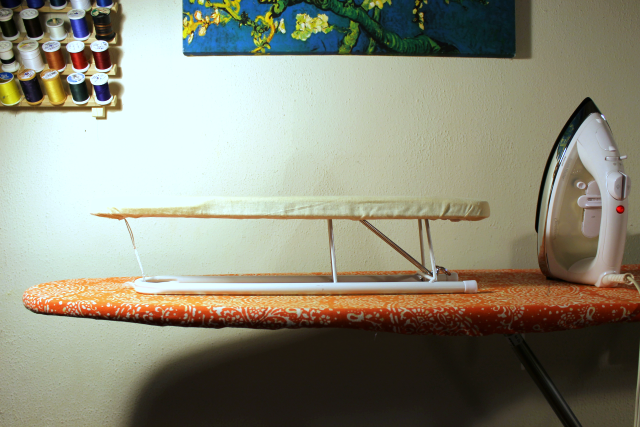 And the stakes aren't that high -- you can easily reposition something before the glue dries... or even after. 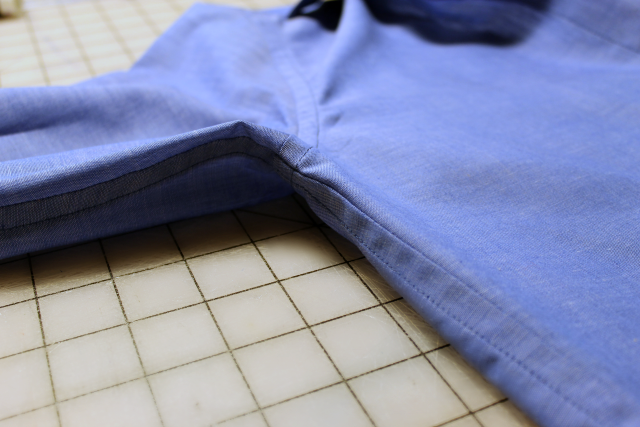 Ever since getting an edgestitching foot (also known as a stitch-in-the-ditch foot or edge-joining foot), my shirtmaking confidence has skyrocketed. 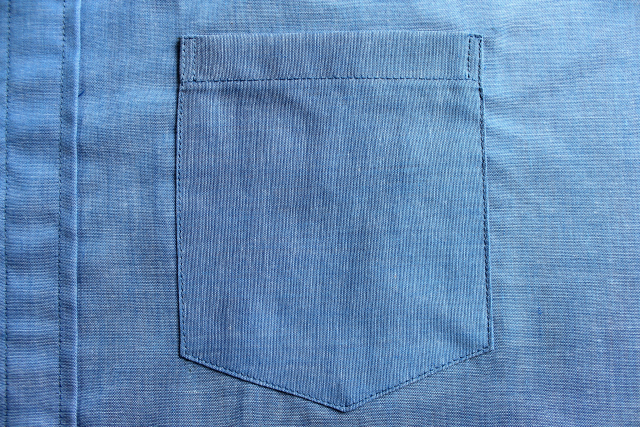 It has a centered guide that enables you to sew precisely at 1/16" or 1/8" from a seam or the edge of your garment, or directly within a seam if you need to. 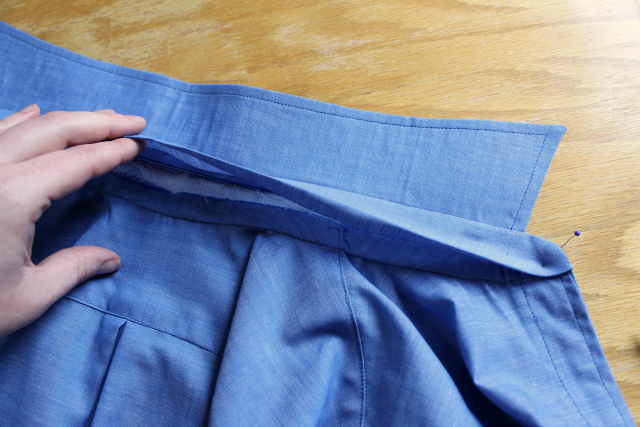 Of course it's not impossible to sew close to the edge without one, but I can't tell you how many times I used to seam-rip and redo my edgestitching, especially on the back yoke when there's a long horizontal line where any wave in your stitches is very obvious. I just couldn't stand the thought of people sitting behind me on the subway and staring at my crookedly-stitched yoke. NIGHTMARES. 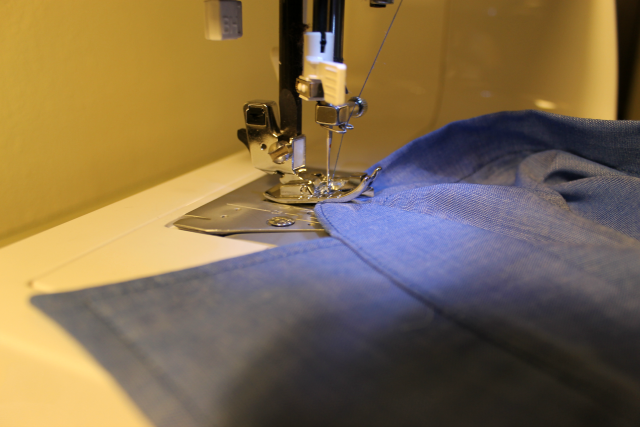 It sounds fussy but I don't mind investing money in sewing tools that produce satisfactory results almost every time without having to put in much more time or effort to learn how to use it, and this is one of those things. I bought this generic snap-on foot from Amazon that works with most low-shank machines. It was about $10. 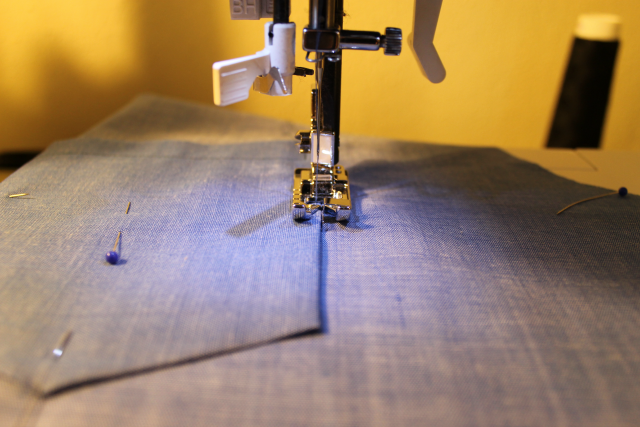 If you shove some scrap fabric under the foot behind the piece you're sewing, the presser foot will no longer be tilted up at an angle and it will sew forward much more smoothly. This was a game changer for me when top-stitching collars points and collar stands. No more tiny little struggle stitches on full display around your face! This is probably one that's only worth it if you sew a lot of long-sleeved shirts (or other kinds of narrow tubes, I guess). 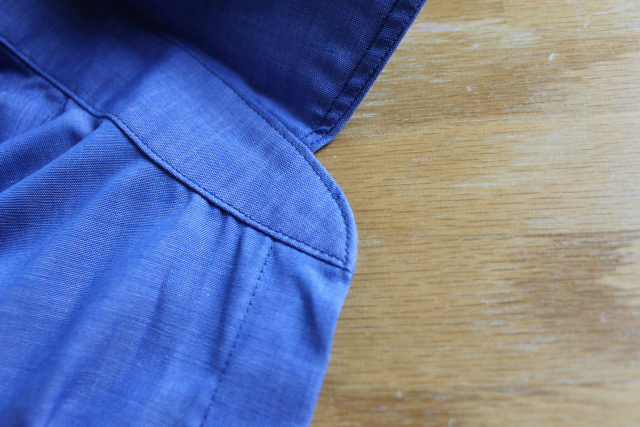 Before now, I always just serged all my shirt seams, but now I've been forcing myself to make French seams or flat-felled seams because they're more attractive when the sleeves are rolled up, which for Corey and me is always. 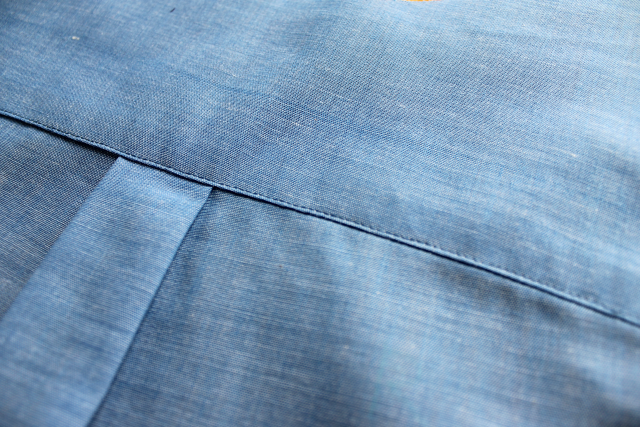 Pressing all the way down the sleeve seam is essential for this kind of finish, so it's just easier to have a sleeve board for this process so you can flatten out and fold the seams most efficiently. 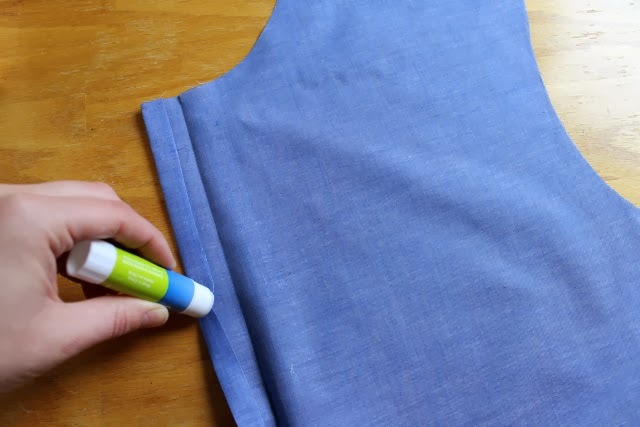 If you're desperate, though, you can just stick a narrow rolled up towel down your sleeves, too, though it will be a bit squishy and may not get your seams as flat. And that's it! I tried thinking of five tools but these are really the only ones I use regularly. I own some other stuff like an expanding buttonhole placement ruler gauge thingy, but I find it sufficient to measure buttonhole placement with a normal straight ruler. 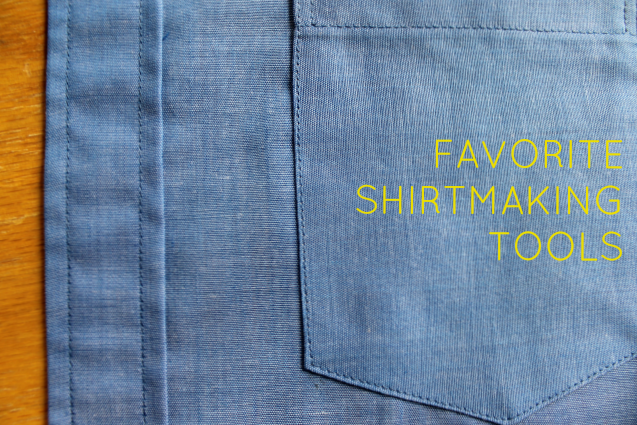 What are your favorite shirtmaking tools? Any that I haven't thought of? Chime in, buttercups.